“If I could only pick only one piece of advice that I have carried throughout my career as a Technology and Product leader, it would be: stay technical. Staying technical doesn’t necessarily mean spending your time creating wireframes, pulling complex database reports or coding, but that you could do it if you had to. Staying technical means understanding what your team does, how they do it, what technologies or tools they use and the principles of how those work. • It shows that you can walk the walk: showing your team that you are willing to walk the walk with them builds trust and respect. You are part of the team, you do not sit in your ivory tower making decisions in a vacuum. •It improves your decision-making process: how can you work on the overall strategy if you don’t understand the tactics? Or even worst, not understanding the tactics could lead you to make decisions that will harm the overall outcome. •And last but not least, it enables you to HELP: that is our main job as leaders. Staying technical – together with your years of experience – enables you to help the team: removing obstacles, reducing pain points and thinking through problems. •Ask a lot of questions: search to understand how things work and why things are done the way they are. Be candid on your intentions from the get-go to avoid your team to feel challenged with every question you ask. •Read, and read a lot of subject matter books: I am personally biased against “how to” books, I’d rather focus on the ones that describe personal experiences. •Tinker around: give yourself some time to play as part of your learning process, either with a tool, a technology or a framework. It is important to remember: you are not the technical expert. 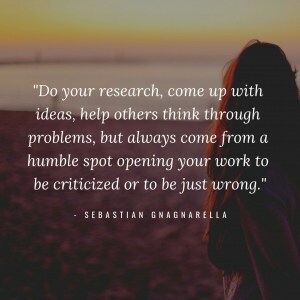 Do your research, come up with ideas, help others think through problems, but always come from a humble spot opening your work to be criticized or to be just wrong.